Watch the sun set over the lake from your favorite chair and set your cares adrift. 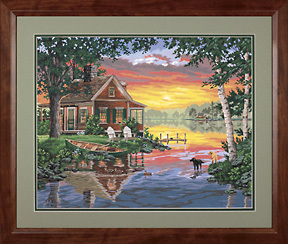 Take a break from your busy world to create a relaxing scene following our easy instructions and numbered canvas board. Kit includes printed canvas board, 18 pots of acrylic paints, paintbrush, and instructions.